I had heard of the opening line of "Silver Sparrow" long before I knew anything else about the book: "My father, James Witherspoon, is a bigamist." At once it captures everything and nothing about the core of this powerful novel of family, secrets, and trust. Dana grows up knowing she's the other daughter. In order to keep her father's two lives separate, she must defer to anything Chaurisse wants - Dana can't go to the same school, summer programs, or anywhere she might run into Chaurisse. Meanwhile, Chaurisse has no idea her father has another wife and daughter living in the same city. The first half of the book is told by Dana as she grows up, navigating the world and figuring out where she can rebel against her father's strict rules of separation and learning as much as she can about her mysterious sister, while resenting all she must give up to keep her father's dual lives. The second half shifts to Chaurisse's point of view. The reader sees Dana pop up, and the dramatic irony and tension is perfect. We know who Dana is and that this can only end poorly, but Chaurisse has no idea. Jones does a remarkable job balancing the two points of view. I thought after reading Dana's section that I would loathe Chaurisse, but her section was every bit as empathetic and earnest and heartbreaking as Dana's. The lives and backgrounds of James and his wives were fascinating and the historical details from Atlanta's history fleshed out the story without feeling the least bit forced. Verdict: Affirmed, particularly for readers looking for an incredible family drama and/or a solid book club pick. Audio narration was fantastic, for those who listen. 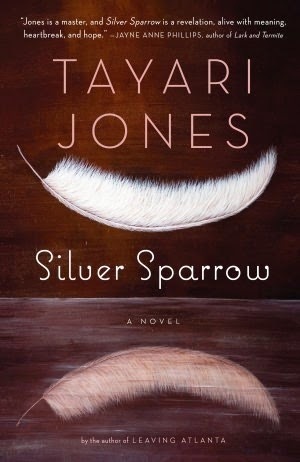 "Silver Sparrow" by Tayari Jones, published May 24, 2011 by Algonquin Books. Audio narration by Rosalyn Coleman Williams and Heather Alicia Simms, published June 8, 2011 by AudioGO.